Jack Dorsey has been summoned by a Parliamentary panel over Twitter's 'bias' against Right-wing handles. But its powers are limited, given its report has mere "persuasive value". New Delhi: Jack Dorsey, the CEO of the microblogging site Twitter, courted some serious controversy not so long ago by carrying a placard that read “smash Brahminical patriarchy”, but if he does appear before the parliamentary panel that has summoned him on 25 February, he will be face-to-face with at least five Brahmins. The parliamentary committee on information technology, which has summoned Twitter representatives over the issue of ‘safeguarding citizens’ rights on social media platforms’, was spurred into action after a volunteer group wrote to it about what it perceives as the platform’s bias against Right-wing and pro-Bharatiya Janata Party (BJP) handles. The Brahmin members of the 31-member panel include Trinamool Congress’ Prasun Banerjee, Shiv Sena’s Hemant Tukaram Godse, and BJP’s Hema Malini, Paresh Rawal and Vinay Sahasrabuddhe. While Malini is a veteran actor, Rawal — also an actor — is extremely active on Twitter and uses it to further his politics and the party’s agenda. Also on the panel is media baron Subhash Chandra, the chairman of Essel Group. Other members include veteran BJP leader L.K. Advani, Congress leader Raj Babbar, CPI(M)’s P. Karunakaran, and Samajwadi Party’s Beni Prasad Verma (). 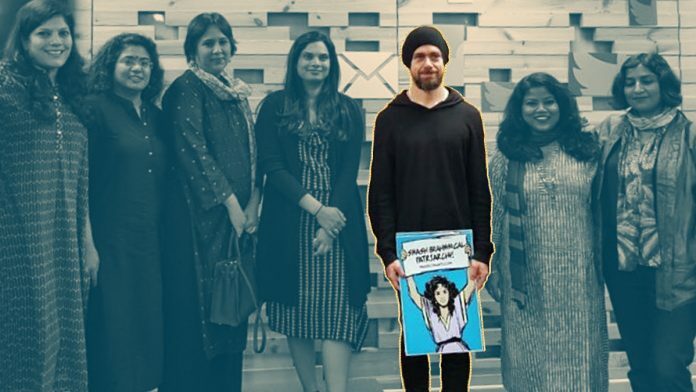 In November last year, Dorsey had landed himself in a spot during his visit to India when, at a meeting with women journalists and activists, he posed for a group photo holding a “smash Brahminical patriarchy” placard. Much outrage and backlash followed, compelling Twitter to issue a statement clarifying its position and expressing regret. The 25 February summons is the second attempt by the parliamentary committee on information technology to get Dorsey to appear before it, after US-based Twitter said the earlier date, 11 February, was too short a notice for its senior officials to travel to India. With Twitter not sending its top representatives Monday, BJP MP Anurag Thakur — who heads the committee — said the panel “takes very serious note of this” and “will take appropriate action on 11 February”, even as his party colleagues chimed in to say Twitter would have to face “repercussions”. However, even as Thakur and others in the BJP flex their muscles, the committee’s powers are eventually limited, given that its report merely has “persuasive value”. The situation is made more complex by the fact that general elections are barely months away and the 16th Lok Sabha will be dissolved soon. The rules of the Lok Sabha very lucidly lay down the powers and role of department-wise parliamentary committees, including the conditions under which they can summon or invite people to appear before them. According to the rules, “a witness may be summoned by an order signed by the secretary-general and shall produce such documents as are required for the use of a Committee”. The rules also say the panel will have the power “to send for persons, papers and records”, and “if any question arises whether the evidence of a person or the production of a document is relevant for the purposes of the committee”, the decision of the Speaker will be final. It remains unclear under which of the two categories Twitter representatives have been called by the panel, though the first option is largely meant for government representatives. Most importantly, the reports of these committees — to be based on “consensus” — are not binding and are more advisory in nature. “The report of the Standing Committees shall have persuasive value and shall be treated as considered advice given by the Committees,” the rules state. Thus, even if the panel recommends a harsh measure against Twitter, the government need not accept it. Incidentally, Prime Minister Narendra Modi, his entire cabinet and other senior BJP leaders are all ardent users of the microblogging site. This is pure castism do you even realize it The Print ?? Please stop joking — but again, since you’re a RW, you can perform genuine comedy unwittingly only! I understand that this must’ve been spelled-out loud for you already, obviously for-free! I’m just gonna reiterate that: Per the recent formal definition, you can’t be casteist against somebody who’s at the top of the food-chain. To spell-out: Is an integral part of the Establishment. And in any case, given you’re a radical “Conservative” so even if so backflips to accommodate your worldview: Even by older definition, this is still not casteist as she’s Brahmin herself. Try something else. Better Luck Next Time! If any comment is made againsta minority community the tukretukre gang are up in arms…..if this mi oritygrouphappens to to be Brahmins howe er,their stance is the opposite….why ? Beingborn Brahminis a biological process………and India claims to be a secular country. Try again! I know that being a predictable creature dubbed “Conservatives”, you’re referring to the India’s largest minority (most of them Mohammedans, a handful of them true-blue Moslems) and by “टुकड़े-टुकड़े” epithet, we all know who! It’s a synonym of “Urban Naxal”, after all. “Gazillion” people, and to be specific: Enough of Indian residents get away by spewing venom against them across ‘pop-Interweb’ on a routine basis. Not just indirectly but even directly! The actuality of such a rhetoric is a debate for another day.